As I said in my first post on SolidWorks 2010, Drawings received A LOT of enhancements! Today we are going to take a look at a few of them that relate to dimensioning. 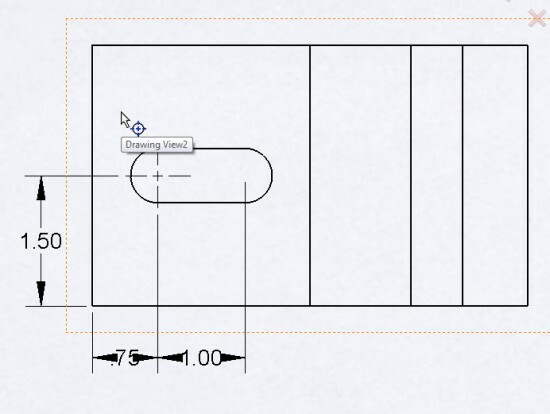 Rapid Dimension is a new option that allows for quick placement of dimensions in Drawings. As soon as you select a edge (or two points) you immediately see a divided circle. For example, if you attempt to place a horizontal dimension, a divided circle appears which has a top and bottom section (each being displayed with different colors). If you select the “top” of the circle, the dimension is automatically placed at the top of the view. If you select the “bottom” of the circle, the dimension is automatically placed at the bottom of the view. 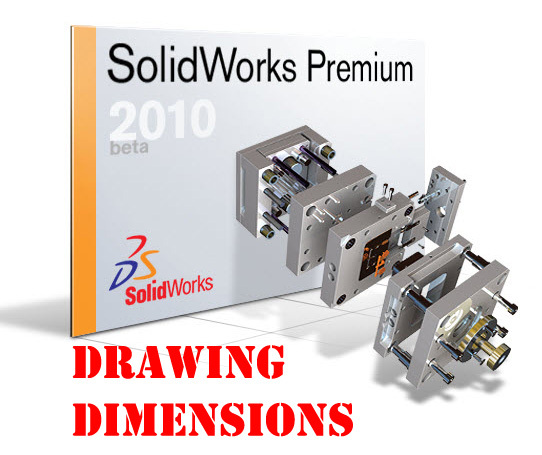 SolidWorks intelligently places the dimensions utilizing the dimension spacing settings in the Document Properties. Rapid Dimension will also MOVE existing dimensions so that spacing settings are not violated. The dimensions are still completely adjustable so that you have the freedom to position them as you please. The Dimension Palette is another enhancement that is sure to be a hit with users. The Dimension Palette is a pop-up dialog that appears near the mouse cursor when a dimension is selected. It allows the user to change common dimension properties right in the graphics area without having to make the changes through the PropertyManager. 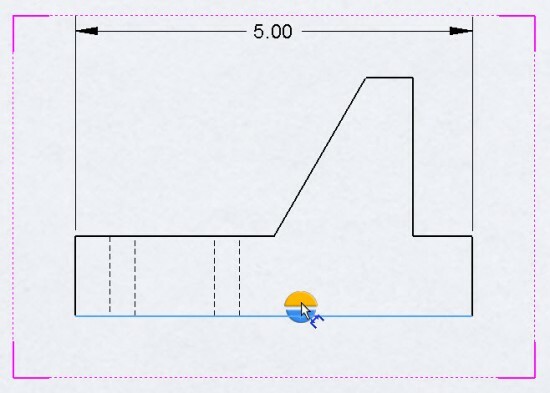 Using this tool will result in less mouse movement and allow the user to focus solely on the graphics area when setting up dimensions in a Drawing. The following adjustments can be made a dimension using the Dimension Palette tool. 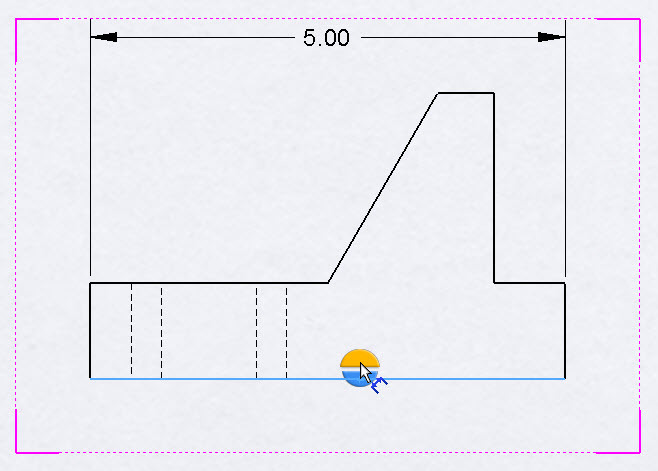 Also new in relation to Dimensions is improved behavior for Center Marks in Drawings. You can now place Center Marks on holes or arcs already dimensioned and the extension lines of the dimensions trim back to the Document Property spacing setting in relation to the Center Mark. Another caveat to this enhancement is that you can now delete the Center Mark and the dimensions will no longer be left in a dangling state. In previous versions you would commonly place Center Marks first and then dimension to them in order to get the proper spacing to the Center Mark for the dimension extension lines. The problem was that if you delete the Center Mark, the dimensions were left dangling. 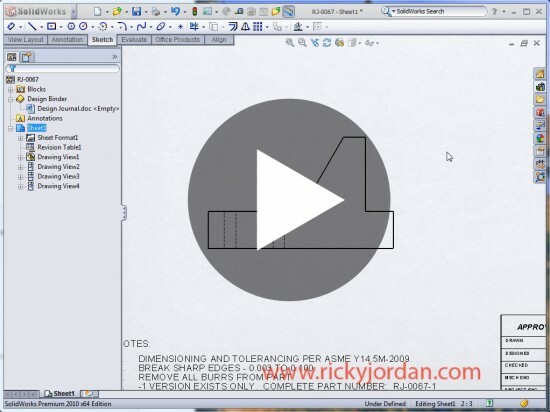 SolidWorks 2010 will allow you to dimension first, and place the Center Marks later with no negative effects. Click on the image below to watch a short VIDEO demonstrating these new enhancements. Stay tuned….much more to come on SolidWorks 2010! Gr8 job buddy. Keep going. Rick, that's cool and it will be used a lot but I've been taught that I'm suppose to use my model dimensions in the drawing. How does it work if you have mostly model dimensions and then add a few other generic dimensions? Does the sapcing still make all the previously model dimeneions move as well? I'm really not familiar with solid works.. When I'm studying in college, studying Bachelor of Science in Civil Engineering, we work on traditional way. With those tech pen and plate, this is the way I finish my drafting subject.. Even in teaching CAD, our teacher didn't taught us well.. Now, I'm really interested to learn about this new things in me.. I'm so glad that I read this.. I hope you will keep posting.. Thanks for sharing. It is useful for me and my friends to learn something new from it. Nice illustrations given by you. It was very useful for me. I think these tips would be definitely useful for professionals also. Thanks Ricky! Great post! Those dimensioning enhancements look good, especially the dimension pallete. One thing I really like about it is the ablility to easily place text in front of the dimension. It has been such a pain all of these years to have to precisely pick the area in front of the <DIM> in order to place text in front of it. Way too tedious. Did they fix the way the centermarks size? From the first releases up to around 2001 Plus, the centermarks would always stay the same size in relation to the DRAWING reguardless of what scale the model was on the sheet. Since then, the centermarks have scaled in size in relation to the scale of the model which is not correct. For instance, if your drawing template has your centermark size set to a default of .125″ and your part is scaled at 1:1 on the sheet, then your centermarks will actually show the correct size of .125″. 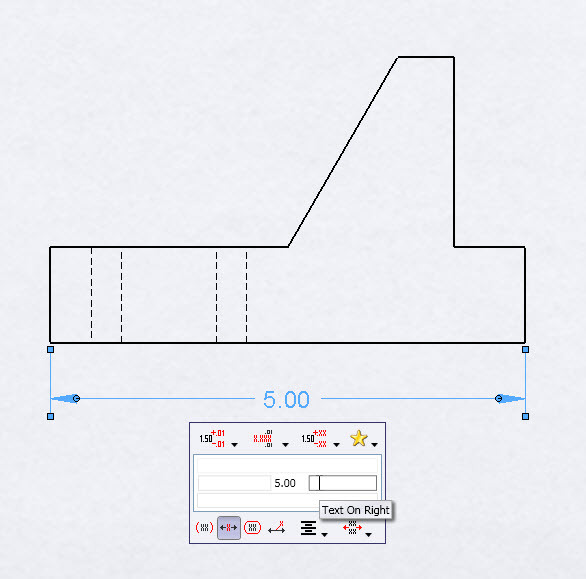 But if your part is smaller and needs to be scaled to 4:1 on the sheet, then your centermarks will show as .5″ in relation to your drawing and you have to change your default. If you create a detail view of 10:1, your centermarks in your detail view will be 10 times larger than they should, so you have to manually change each centermark to look correct. This has been such a pain especially if you have drawings with multiple parts of varying sizes. A long time ago when I used to do drawings by hand, you would never change the centermark size from one view to the next. Keep in mind here that I'm talking about the Mark size, not the extended lines. Great points. I'll check it out and reply back here soon. I ran a little short on time to check this out, but I assure you I will investigate this and let you know what I find out. When I do, I'll leave a reply. It seem so complicated for me to understand ! I dont fully understand, but very interesting. thank a lot of information. may be useful. continue to increase the quantity and quality of your writing. the more qualified you are writing all the more delighted visitors to come back to visit. success always for you. You are awesome ricky. I am new here. This is your hobby or work? COOL…that was a rare piece of art. Your design is really amazing! You could make a solidworks tutorial to teach some techniques. In many ways, SolidWorks 2010 reminds me of the “duck-pond syndrome.” Everything seems calm and quiet on the surface, but there's a lot of powerful paddling going on below the waterline. Nice tutorial. Thanks for this post I have learned a lot. You have done it very nice and the video and pictures are good. Keep it up. Nice tutorial and your screenshots help in your discussion and I have to admit that you have done the editing great and clean. Congrats, keep it up. This is so cool.I wish I had this when I was doing My Mechanical Eng in College, then I don’t have to draw using using a sharp pen with ink that can blur in a spill. Thanks for this informational material . I cerebrate it because it might be truly usable to if you are thinking about the option of learning using this. Wow, such a fantastic idea! My appreciation for you and them coming. Thanks For This Post, was included in my bookmarks.